Finding a phone with a physical keyboard might be tough these days, but a major segment of the smartphone market is still dedicated to those who like to get things done. In fact, many of the biggest brands debut their cutting-edge technology in their dedicated power user brands, which includes series like the Galaxy Note range. Between the latest Samsung Galaxy Note 8, Huawei P20 Pro, and LG V30 Plus, we’re going to dive deep to pick the best phone for power users. To distill this comparison down to the power user experience we’re going to focus on a few key areas. Multi-tasking capabilities and screen real estate, performance and multi-media, and the software experience. For a full overview of these handsets, with detailed closer looks at camera capabilities, check out our full reviews. There are a few reason why we picked the Huawei P20 Pro over the Mate 10 or Mate 10 Pro. First, the larger 6.1-inch display and 18.7:9 aspect ratio makes the P20 Pro feel like the better multi-tasker. It’s also still a fair comparison from a performance perspective. The P20 series uses the same Kirin 970 SoC as the Mate 10, keeping it within the same SoC generation as the older Note 8 and V30. Ultimately the P20 Pro is probably the phone that Huawei power users fans will eyeball now. As for the Note 8 versus Galaxy S9 Plus — enthusiasts still love that S Pen. Before delving into the specs let’s talk about sheer size and bulk. The Note 8 is definitely the largest of the three. It’s the heaviest too, at 195g, though the P20 Pro isn’t far behind at 180g. Despite its size, the curves on the Note 8’s make it comfortable to hold and the added heft keeps it feeling substantial. The P20 Pro is similarly comfortable and weighty, but the more rounded edges make the phone feel a bit chunkier despite it being the thinner of the two. The V30 has a very different feel, both down to its much lower 158g weight and wider display, and as such it’s bound to split the crowd. The best phone for power users has to offer top-class performance, but there are no Snapdragon 845s here. Instead, all three are powered by 2017 SoCs like the Snapdragon 835, Exynos 8890, and Kirin 970. However, none of these will leave you wanting for performance. We extensively benchmarked these chipsets and found roughly comparable results across a range of tests. The LG V30 scored slightly worse on multi-core and graphics tests than the other two. In real-world usage, none of these phones seem to skip a beat. Even though the LG V30 “only” boasts 4GB of RAM compared to the 6GB in the other handsets, multi-tasking is a breeze on all three. Those looking for more flexible storage options will be disappointed by the Huawei P20 Pro. Its single internal storage configuration is set at a hefty 128GB, but the lack of microSD card is a big blow that limit its the maximum storage capacity to well below its rivals and forces users to rely on cable connections to move large media libraries between devices. The largest sized Note 8 even doubles the P20’s internal storage if you’re prepared to pay for it. 128GB goes a long way, but those with large lossless music or high-resolution video collections will almost certainly want expandable storage. Sticking with the subject of media for a moment, heavy video consumers will be pleased to see all three of these handsets support HDR. Netflix recently added the Huawei P20 series to its list of supported devices, joining the Galaxy Note 8 and LG V30. All three handsets also boast a selection of Bluetooth audio codecs for superior listening quality with compatible headsets. The Note 8 supports aptX and LDAC with its update to Oreo, but the P20 Pro and LG V30 support the higher resolution aptX HD as well. Battery life is just as important as performance in our search for the best phone for power users, and we’ve stuck all our phones through our battery testing suite. Mileage may vary on a case by case basis, but these results should give you a good idea about which type of tasks each phone can handle for the longest. The Huawei P20 Pro is the clear winner overall, combining the longest lasting battery with the quickest recharge time to full. The combination of a large 4,000mAh battery and Huawei’s SuperCharge technology is a potent combination. The LG V30 put up some stiff competition in the video playback category, but it’s probably the worst option if you’re more of a web browsing type. The Galaxy Note 8 clocked good performance across the board and should last a day of heavy use in most scenarios. 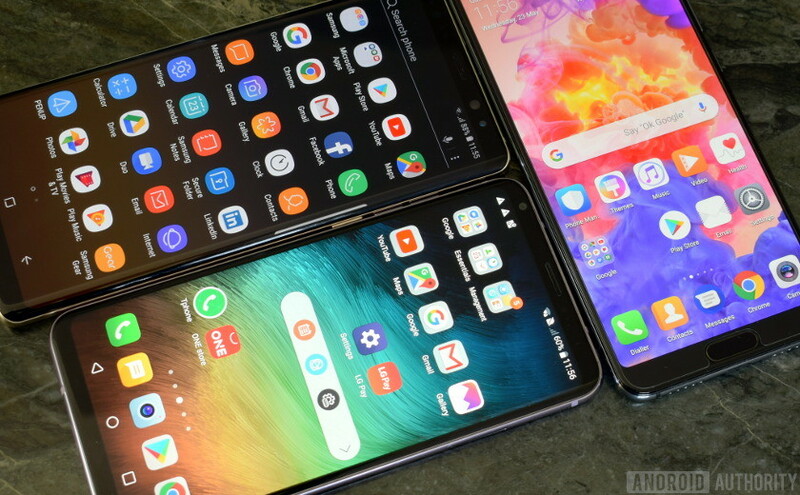 All three of these handsets offer up plenty of screen real estate, clocking in at 6, 6.1, and 6.3 inches each. That’s not a big difference until you start factoring in the aspect ratio, which makes the P20 Pro the taller display for its size — if you include the notch — followed closely by the Note 8 and then the V30. When stacking apps in split-view mode, the Galaxy Note 8 the most usable space owing to its larger panel. The Note 8 can extend this available space further with a quick toggle to hide and show the navigation keys. However, the Huawei P20 Pro can retain some physical navigation with its fingerprint scanner swipe gestures. If you can adjust to the new navigation method (it doesn’t take long), the P20 Pro can rival the usable display height of the Note 8, making these two the better options if you use split-view mode regularly. Use fingerprint gestures and the P20 Pro matches the Note 8 for usable screen space in a smaller form factor. There are a few interesting points to make about resolution here. Out of the box, the Galaxy Note 8 defaults to FHD+ (2,220 x 1,080), rather than QHD+, to save battery. This makes it comparable in pixel density to the P20 Pro. Personally, I struggled to see any noticeable difference between the two resolutions — the quality of the different displays is a much bigger factor. The V30 has a yellow-blue tint and overall seems a bit dull compared to the P20 Pro and Note 8. The P20 Pro has a slight red tinge next to the Note 8, but it offers a comparative level of pop and color. It also lets you calibrate the display color to your liking. While we’re on the subject of multi-tasking, let’s delve into some of the more unique UI features. Samsung’s UI doesn’t always sit well with Android traditionalists, but the Note 8 is the only phone to keep the app drawer enabled by default. You have to dig into the settings menu of the V30 and P20 Pro to enable the app drawer manually. Samsung’s UI also makes the best use of the large screen size, with smaller icons, more compact UI elements, and edge display features you may or may not want to use. Huawei’s EMUI and LG’s UX 6.0+ are comparatively rather ugly, favoring larger, playfully colored icons that certainly don’t scream professional, along with text and scaling sizes that don’t make the most of the large displays. You can address display scaling if you’re prepared to fiddle with the respective View mode and Display Size settings, but its an added step Samsung avoids. EMUI offers up a few niche productivity enhancers. The App Twin feature is very handy for separating business and personal accounts. There’s also a second secure login option via Private Space and File Safe offers up a secure folder if you need it. LG’s Floating Bar fits a similar role to Samsung’s apps and People edge, although LG’s implementation is actually a tad more customizable. LG also offers a selection of customization options for its lock screen, making it quicker to get to your most used apps. Are phones the new PCs? If you’re looking to maximize productivity on your phone, you might be interested in the desktop packages included with these handsets. Huawei’s EMUI and Samsung’s Dex provide a full desktop workstation if you want to connect your phone to a monitor or TV via HDMI. The LG V30 only offers screen mirroring locked to portrait mode, making it essentially useless for firing through multiple emails and documents fast. There are a lot of comparisons between EMUI and the latest version of Dex. Both offer a very similar desktop experience, with full notification support and access to your full suite of apps. However, there are some UI differences, such as the app drawer, and some apps work a little differently. The Netflix app’s menu appears in landscape mode in EMUI, but it’s clearly a portrait phone emulation when using Dex. Meanwhile, Dex gives you access to the Play Store, but you’ll have to switch over to your Huawei phone to launch the store and download new apps with EMUI. Fortunately, the P20 Pro still works when plugged in, which isn’t the case with the Note 8. Neither the Note 8 nor P20 Pro slowed down in desktop mode, even when running multiple demanding apps at once. The P20 Pro hit its limit for multi-tasking a little quicker though, and automatically closed apps when RAM became full (although it took me 12 running apps before this happened). This is most likely because the P20 Pro still runs Android on the phone while you use its desktop functionality — its memory is split between the phone and desktop environments. Dex shuts the phone down to divert all resources to the desktop environment. I’m still not convinced this is a major must-have feature in our search for the best phone for power users. But if you’re looking for a backup or way to ditch your laptop on the road, Samsung Dex and Huawei’s EMUI offer some viable alternatives. All three of these handsets have something to offer power users, but they each play to slightly different markets. The LG V30’s HDR display, enhanced video recording capabilities, high-quality audio signal chain, and expandable storage options make it an ideal handset for those who consume plenty of high-quality media. However, for the productivity-focused, the larger display, better UI, and HDMI desktop features make the other two handsets better choices. The Huawei P20 Pro leaves some of the core boxes unticked for power users. The lack of expandable storage is almost certain to be a sore point, as is the lack of 3.5mm headphone jack. However, the handset wins big in battery life — even the heaviest users can make it through a full day and probably more. The triple camera, which we have already looked at in detail, is also a powerful lure if you’re into taking a lot of snaps. If the Galaxy Note 8 is a little too large for you, the P20 Pro could be the perfect alternative. Samsung’s Galaxy Note 8 is certainly the best all-rounder and fans of the S Pen still don’t have a viable alternative. Combined with excellent battery life, expandable storage, UI optimizations to make the best use of the large screen, and even desktop support, the Note 8 still sets the standard for other phablets to beat. The P20 Pro and LG V30 come close, even exceeding Samsung’s option in some regards. But the Galaxy Note 8 remains the best phone for power users overall so far in 2018.